Enjoy your dining experience here at Floyd’s Crossroads Pub. Sit back, relax, and enjoy our hospitality. Home Cookin’ takes a little more time than normal and is worth the wait. Please note that during the busy summer months we are UNABLE to take kitchen carryout orders as our kitchen is very small and cannot accommodate both the restaurant and carryout at the same time. We are sorry for any inconvenience. 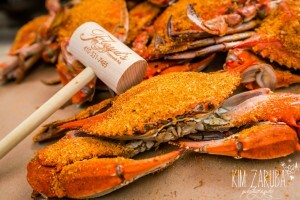 Our crabs are available for carryout ALL the time.